MS® Syringe filters are purpose-built with features designed to bring the highest levels of performance and purity to your research. We incorporate a variety of membranes to offer separation and purification solutions for the majority of your laboratory needs. MS glass fiber syringe filter is designed for clarification of extremely viscous samples that may clog a membrane filter is not necessary. 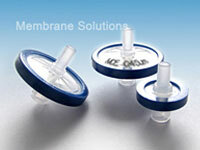 Moreover, this product has a high contamination loading ability for high throughputs.